Aplite. (Gk. haplous = simple, single; lithos = stone). 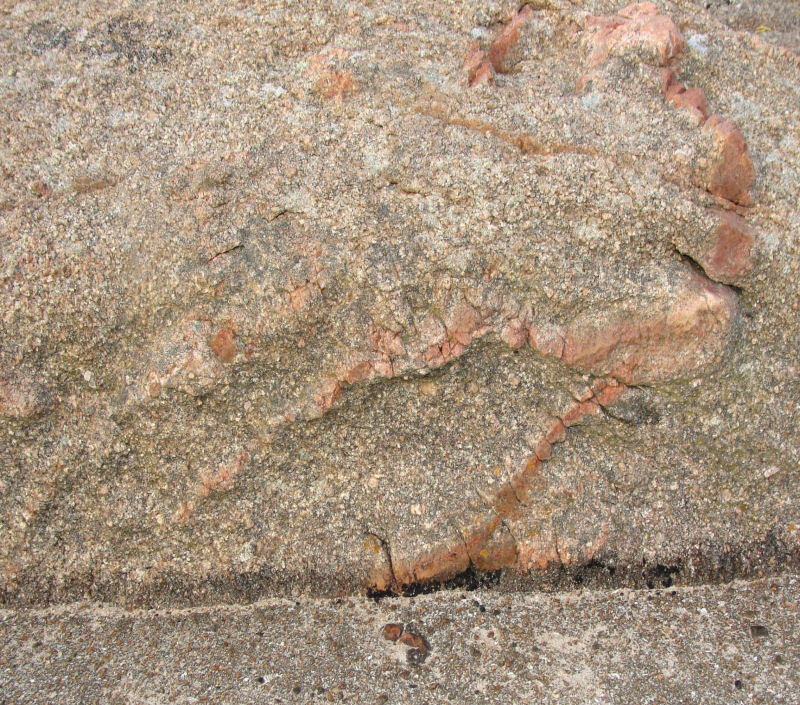 Aplite veins in La Corbière granite; lighthouse causeway. Aplites are light coloured, acid, uniformly fine crystalline igneous rocks composed of quartz and orthoclase feldspar (Allaby & Allaby, 1999, p. 30) or quartz and feldspar (Bishop & Bisson, 1980, p. 119). 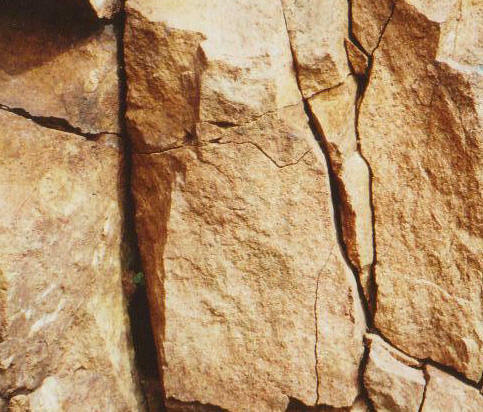 In Jersey, they crop out as individual masses in the igneous complexes and in all the granites as pink and red veins 1-5cm wide, and dykes 1-2m wide; their dips, strikes and sometimes cross-cutting relationships are easily recognisable. The Southwest Igneous Complex contains many aplite dykes and veins, as well as a very interesting lens, which are excellently exposed in the wave-cut platform north of La Corbière and eastwards to beyond La Rosière (Nichols & Hill, 2004. pp. 61-74). However, they have also been described as having granitic affinities with granite mineralogy but rare biotite (and there are also syenite, diorite and gabbro aplites). Tourmaline, topaz and fluorite are also present (Whitten & Brooks, 1972, p. 28-29). In Jersey, there are two granites described as aplogranites in the Southwest Igneous Complex which crop out on the western side of St. Brelade's Bay (Bishop & Bisson, 1989, p. 55). In the first case, the central mass of the complex is named the Beau Port granite (loc.cit.) but as the St. Brelade's granite on the Channel Islands Sheet 2 (IGS, 1:250,000 series, 1982). 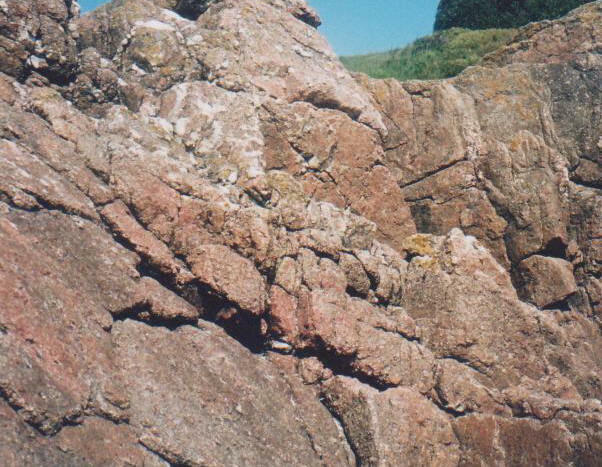 This is partly surrounded by a narrow outcrop, c. 250m wide, of the second, a porphyritic aplogranite, named the La Moye granite where the groundmass is similar to the adjacent aplogranite. 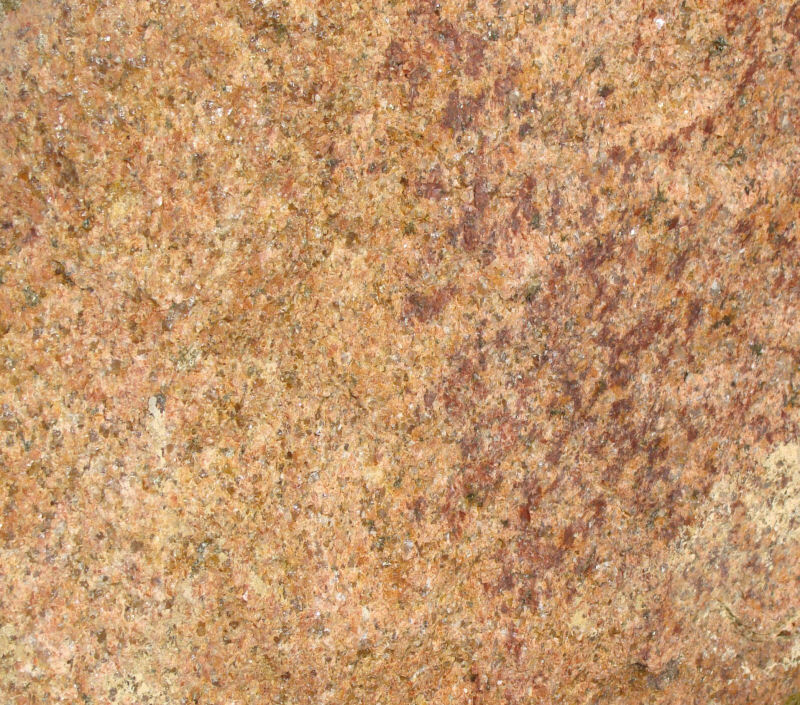 The Beau Port / St. Brelade's granite varies from pink to yellow-brown, due to the variable presence of haematite and limonite, and is finely crystalline, almost saccharoidal in texture consisting largely of quartz and feldspar (perthite, and oligoclase) with minor biotite and hornblende (Bishop & Bisson, 1989, p. 56). Le Beau Port aplogranite showing its colour, texture and joints. 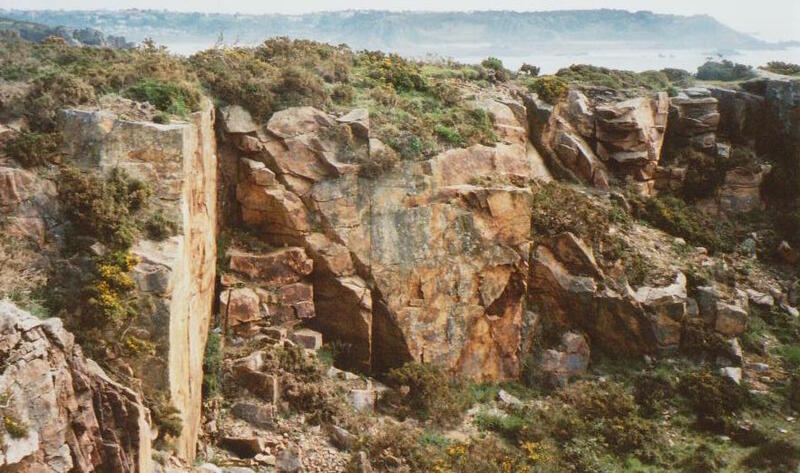 South of La Moye Prison, the variable oxidation, its well jointed nature and a wide, vertical pink aplogranite dyke can easily be seen exposed in a quarry alongside the coastal cliff path (above right) (Nichols & Hill, 2004, p. 61-74). Brown et al. (1990, p. 195 et seq.) describe the central aplite as a Microgranite. Aplogranite is also one of four granites in the Northwest Igneous Complex and crops out at its eastern end where it is named as the Mont Mado granite locally and by Bishop & Bisson (1989, loc. cit. 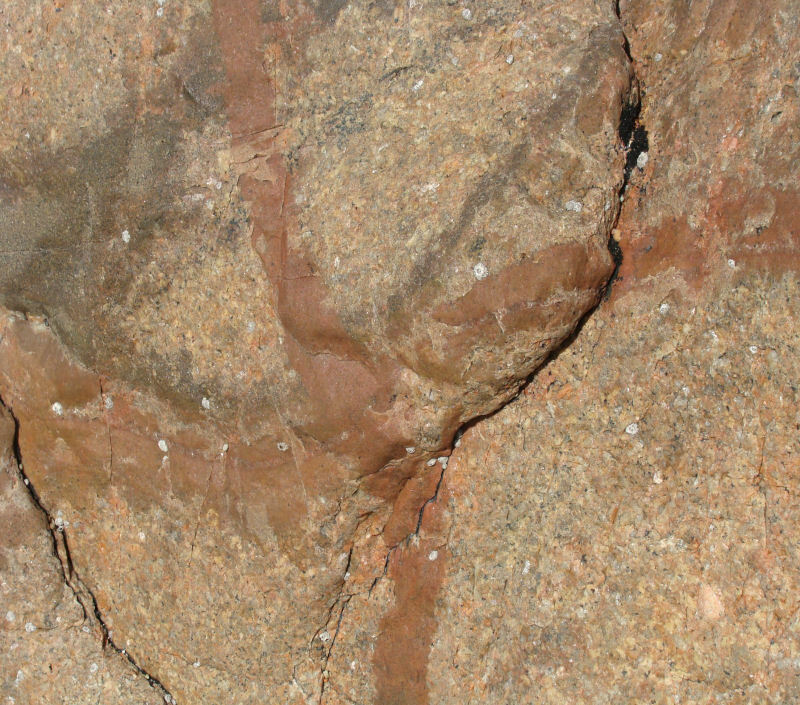 ), but just as a Red Granite by Brown et al (1990, p.195 et seq.). This granite is also finely crystalline with most crystals c.1mm in size and consists of quartz and orthoclase (perthite) and with minor mafic minerals (illustrated above). The colour variation is beautiful, from various shades of red and brown to yellow, dependant upon the depth of weathering and hence oxidation. There is a gradual increase in small biotites and possibly hornblendes westwards towards La Saline where it is still quarried. 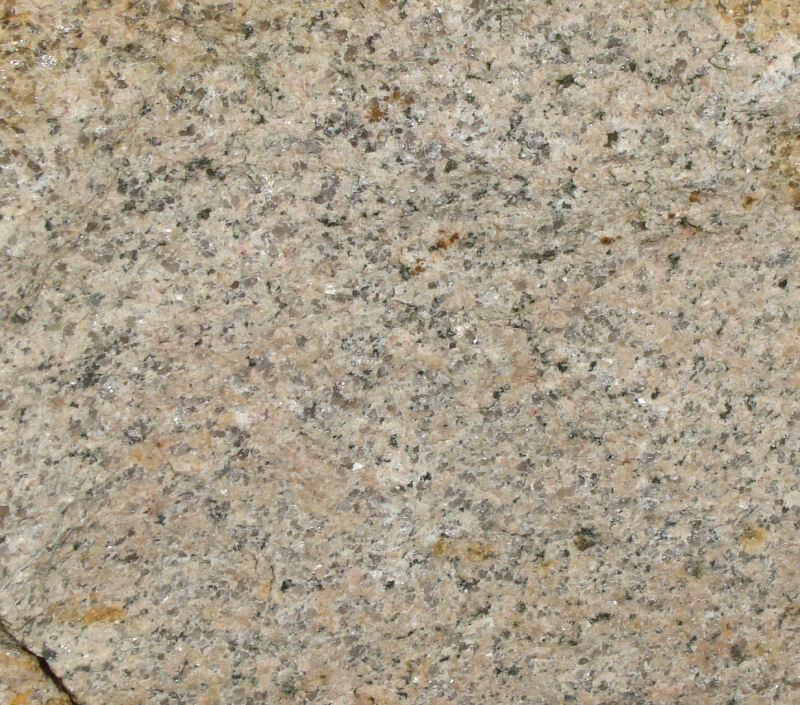 A fourth granite, a light to medium grey, biotite microgranite at Le Rouge Nez, east of La Grève de Lecq (Brown et. 1990, p.195 et seq.) looks texturally like an aplite but has variable amounts of biotite. Aplite veins and nearby pegmatite areas, in SE granite along La Rocque harbour jetty. The composition of the quartz and mainly orthoclase feldspar is equal to that of the lowest temperature melts in granitic magma systems and suggests they are residual melts crystallised by differentiation from a granitic magma, probably a dry residual one as there are no hydrous minerals (Apley & Apley, 1999, p.30). Pneumatolytic minerals such as tourmaline, topaz and fluorite are also found in aplites and suggests that they formed from a magma low in volatiles which influenced their fine crystal size (Whitten & Brooks, 1972, p.29). NB. Aplite veins occur in the same granite outcrops as pegmatites of large, white milky quartz and pink-red orthoclase crystals as illustrated above, and are thought to be from a magma rich in volatiles (loc.cit.). They also contain small quartz pegmatite areas, often centrally, showing the same relationship as the larger outcrop associations. 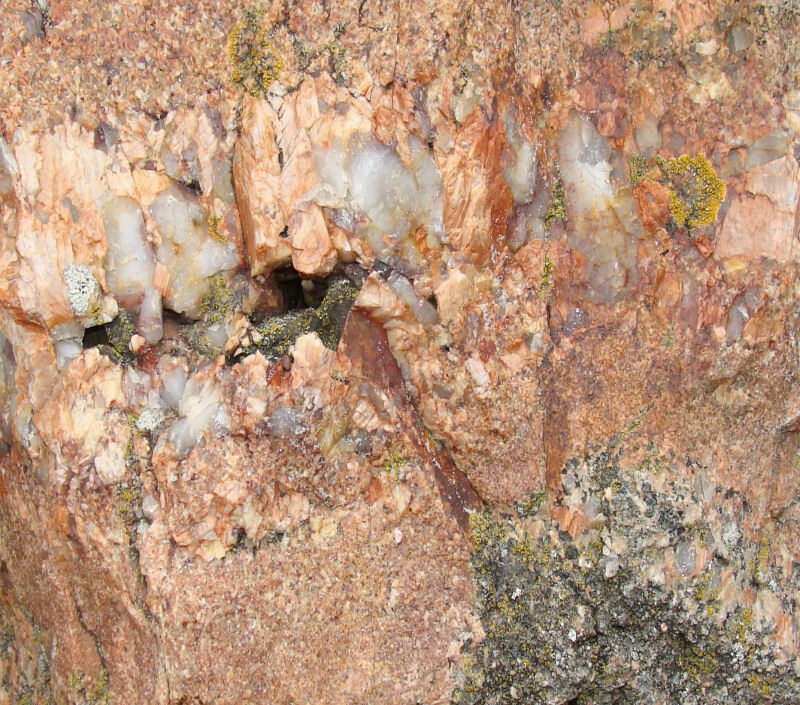 Quartz in aplite vein, La Corbière granite. Allaby, A. & Allaby, M. 1999. A Dictionary of Earth Sciences. Oxford University Press. Bishop, A. C. & Bisson, G. 1989. Classical areas of British geology: Jersey description of 1:25,000 Channel Islands Sheet 2 (London: HMSO for British Geological Survey).